Custom keyboard shortcuts in Microsoft Word 2016 will make it so you can move through your documents and projects quickly and seamlessly. It’s easy to set up and easier to maintain once you get all the steps. 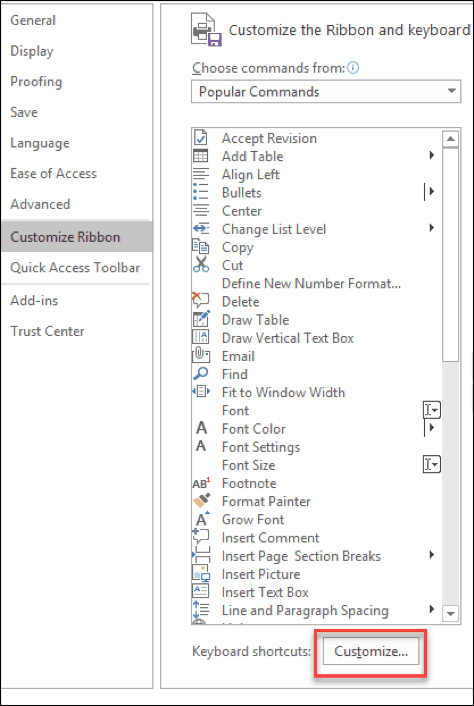 Once you open Word 2016, go to File > Options > Customize Ribbon. 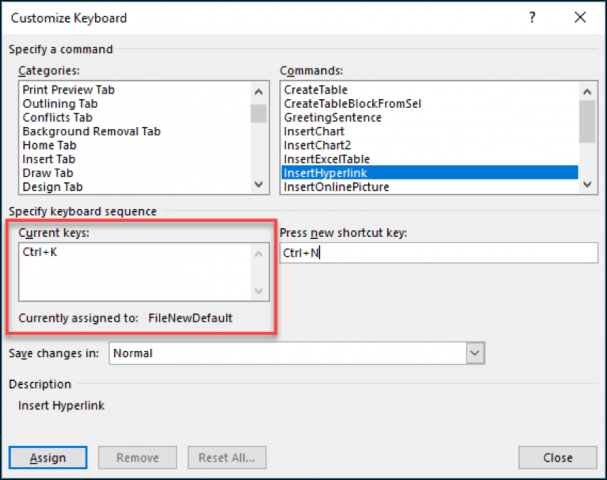 This will open the window where you will see all the default Keyboard Shortcuts. At the bottom of the window pane you will see the words “Keyboard shortcuts:”. Click the Customize button. 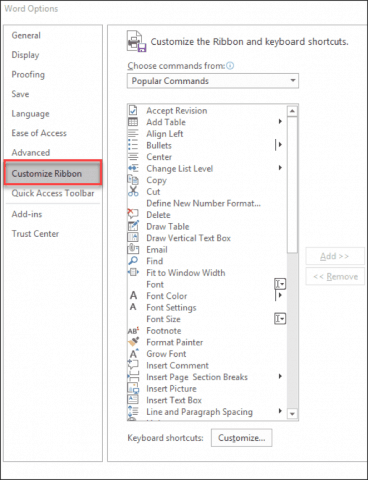 This should open the Customize Keyboard Window in Microsoft Word 2016. Here is where you can select and choose the shortcut you’d like to customize from the Categories and Commands boxes. Where it says Press new shortcut key, this is where you will assign your custom keyboard shortcut. Tap on the keyboard buttons you want to use for the shortcut, and click Assign. Note: You can save changes in Normal to apply to all Word documents or save it for the current document only using the Save changes in dialog. 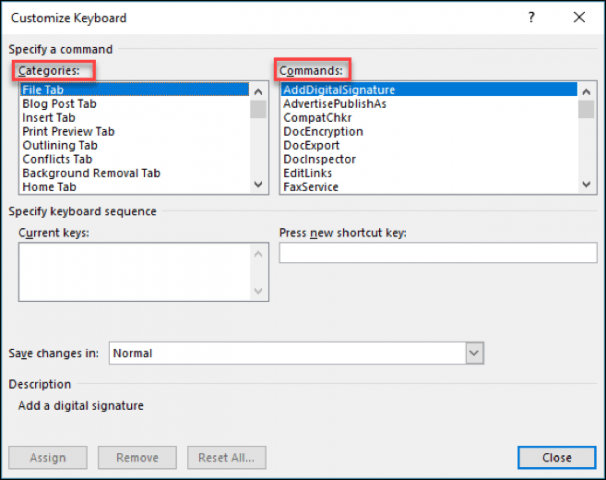 When customizing these keyboard shortcuts in Microsoft Word 2016, you will be able to see what keys are assigned to what. When you click on a command, if there is already a shortcut assigned to it, then it will show in the Current keys box. If you try to assign it a shortcut that is already being used, you will see a “Currently assigned to” text show up below the current keys box. 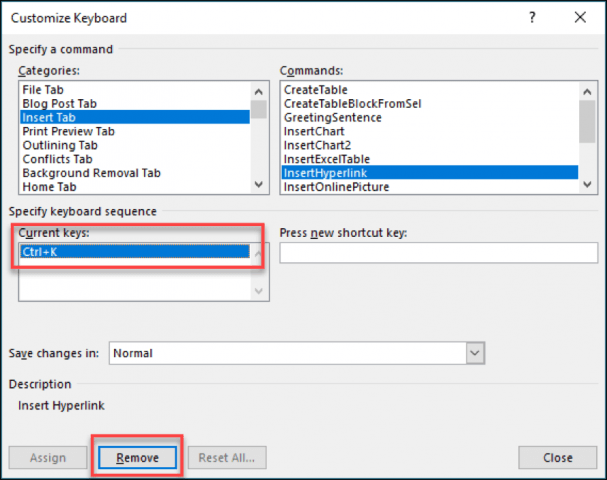 Removing a keyboard shortcut is very simple if you already know how to assign shortcuts. Follow the steps above until Step 3. Now choose the command whose shortcut you’d like to delete. In the Current keys box, select the current shortcut, and click the button below that says Remove. There are so many different shortcuts within Microsoft Word that you can use. There is even one where it will find and replace text within your document. Quite useful with large documents! Now you can create your shortcuts and get more productive with Word.